Currently the HELIO is only available with the proprietary VT operating system. See FMS for information about the Linux port. The manufacturer of the HELIO is VTech . vhl-tools , a SourceForge project, works on utilities, patches, documentation and integration of Open Source software for Linux on the VTech Helio PDA. PocketLinux has a port under the GPL, as well as Debian and Redhat packages. But the URL http://www.pocketlinux.com/ seems no longer available. Figure 7-1. 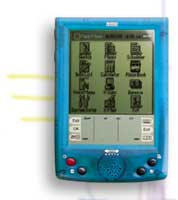 Screenshot of the HELIO PDA.